Antique Rattan furniture evokes contradictory impressions: Casual, but Victorian-formal; Classic, but linked to the 19th century; Ephemeral, but timeless. Today, reactions to rattan furniture range from those owners who can’t wait to get rid of “that old stuff” to furniture collectors who cheerfully troop through endless yard sales to find treasured pieces. Rattan furniture itself can range from battered, half-broken painted thrift store junk to pristine museum-grade furniture displayed in a place of honor. What makes collecting and owning antique and vintage rattan furniture so interesting, and occasionally frustrating, is the vague history of this class of collectibles. Almost every attempt at defining this class of furniture, first gives a quick bow to ancient Egypt (tomb pieces dating to 3,000 BC), before launching into 1930's Art Deco styles. There’s a lot of vintage & antique rattan furniture that was produced between those dates, and much of it is still there, ready to be discovered. Indonesia (particularly Borneo), the Philippines, Sri Lanka and Bangladesh account for the bulk of the world’s production. The wood is solid, unlike bamboo, which is hollow, but it does have section joints. Larger pieces have been used for Malacca canes, beloved of London gentlemen, for centuries. It is the bark stripped from the canes, however, which was soaked and woven into wicker pieces. This bark was also used to wrap around wood (often the stripped core of the original rattan) to make frames, legs and backs. Because rattan is so flexible, it can be bent and shaped into ornate designs, which fitted the Victorian sensibilities exactly. A quick break in the story, here, to talk about wicker. 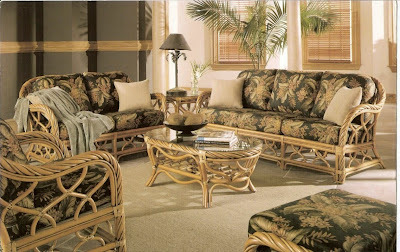 The term “wicker” just describes any woven furniture, usually made from plant materials. A wicker piece can be made from bamboo, rush or even straw. So, rattan furniture is a type of wicker, but not all wicker is rattan. Although it was used to make furniture in India and China, it was the building of the British Empire in India and Malaya during the early 19th century which really brought rattan furniture to the notice of the British, and later the Americans, who lived and traded in Asia. They came to love it. And why not? It could easily be woven into almost any style, it was light and cool – perfect for the tropics – and it was cheap. Very, very cheap. The Wakefield Rattan Company began to produce rattan furniture and sell it all over the United States, where it was soon finding its way to the conservatories, porches and summer parlors of the rich and the well to do. In the 1830's it was a fad; by the 1850's it was a boom; by 1900, it was as common to find rattan furniture in a home as it was to see a cast iron kitchen stove there. Although there were other manufacturers, Wakefield was the largest. In fact, it absorbed its largest competitor, the Heywood Company, in 1897. The manufactured range of wicker furniture (most of it still rattan) was tremendous, and included chairs, tables, love seats, beds and even wheeled chairs used on the boardwalks of popular resort towns such as Atlantic City. By the beginning of the 20th century, however, tastes began to change and Victorian styles went out of fashion. The Heywood-Wakefield Company, as it was now named, then began to produce wicker furniture in what was called the “Mission style,” but the classic age of rattan ended during the Great Depression. And another blip in the record during the 1970s when a style sometimes referred to as “Tiki Bar” was made. Aside from those, post 1930s rattan furniture has primarily relied on reproducing pieces from the 19th century, much of it using synthetic reeds. Almost all of the modern pieces made from genuine rattan have been made in Asia, often the Philippines. Today's antique furniture collectors now concentrate on rattan pieces made during the period 1870-1930. They face the usual challenges of all antique collectors, no matter what is being discussed: repairs, restorations, reproductions and fakes. For rattan furniture collectors, add to that the problem of the material itself. Is it really rattan? Are other materials mixed in, either during production or afterwards. When was a repair made? It takes experience and careful examination to tell, sometimes. Some collectors are willing to buy pieces which have been carefully repaired, but eschew extensive restorations. Others firmly draw the line at painted pieces, but who can tell when it was painted? Is a rattan chair painted in 1880 less antique? Other collectors depend on contemporary advertisements or catalogues for identification of genuine pieces, but that might leave out a short-run production or even a custom-made piece. The latter, while harder to identify and authenticate, could be quite valuable. As you would expect, however, their prices are set at a premium. There are still undiscovered antique rattan furniture pieces out there, but they are becoming more and more difficult to find. What pieces are found in the yard sale jungle have to be considered with a jaundiced eye; they might be genuine, or they might be a reproduction. Even if the style matches a catalogue from the 1890s, for example, it might be a recently-imported piece from Asia. Without a sure way to judge the age or an article of provenance, it’s often difficult to tell. You see the problem, of course. But, many would say that this is part of the challenge, even the joy, of collecting antique rattan furniture. Using a discerning eye, some common sense, a few good reference books and sometimes, just taking a leap of faith is all part of the great collecting game. Where To Shop For Chinese Antique Furniture Pieces In UK? Is Noritake China A Worthwhile Addition to Your Porcelain Collection?